Recently, I was asked by a family friend do do a commissioned work of art for her husband’s sixtieth birthday. I was flattered, and excited for the prospect of a new project. 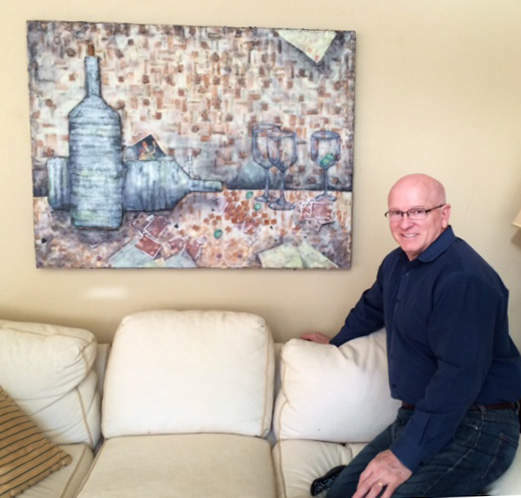 It all began with a very large bag of corks from wine Buddy and Margaret (lovingly called Uncle Buddy and Aunt Margaret, as they have been a part of my family since my parents were in high school) had enjoyed over the last 30 years. 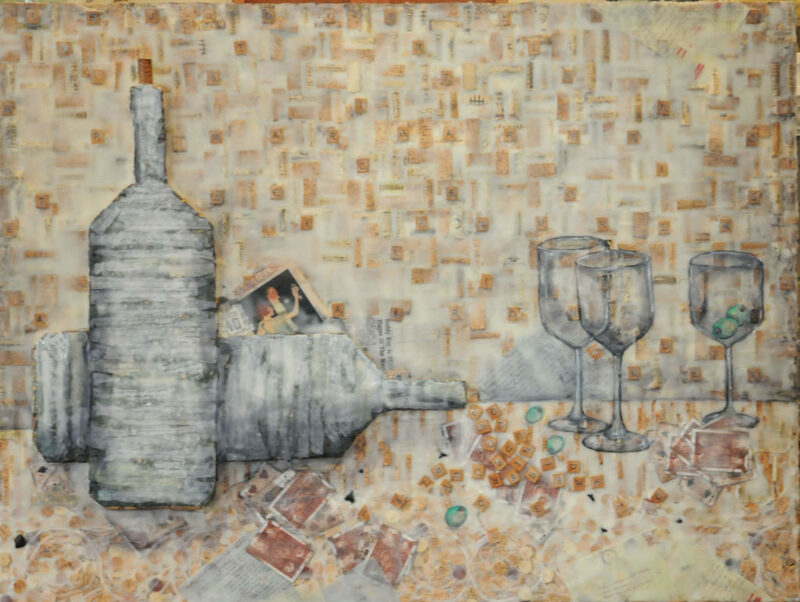 She mentioned she liked my mixed media pieces, and hoped I could incorporate the corks into the work of art. It was easy having a client like Aunt Margaret, because she appreciates art, is open minded, and has amazing ideas that helped me work towards the final piece. 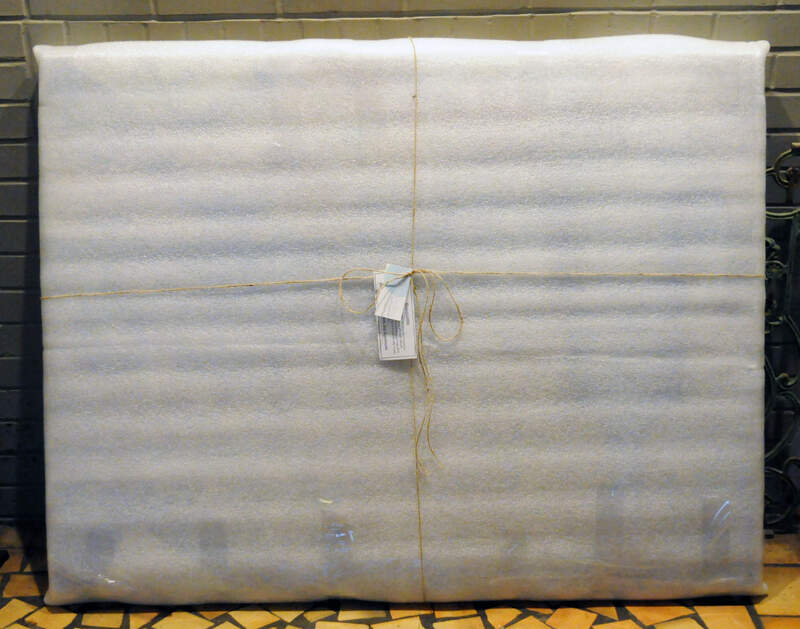 When the first package of corks arrived, ideas immediately began buzzing. 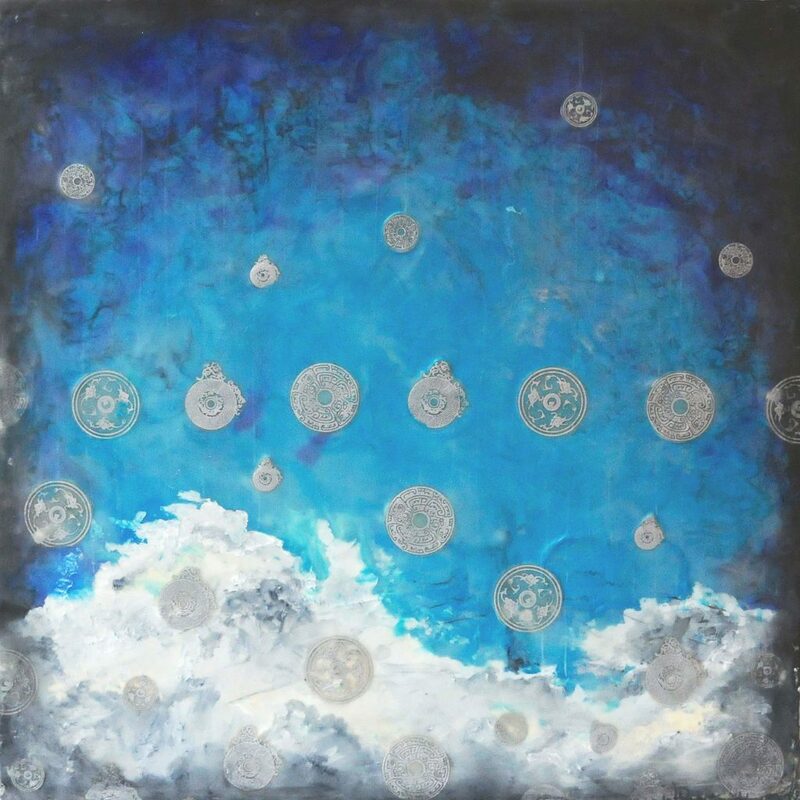 We discussed prices and sizes, and settled on a large, 36″x48″ panel as the base. I decided I would use the corks, and I wanted every inch of the panel covered with them. They would create the base texture for the overall piece. 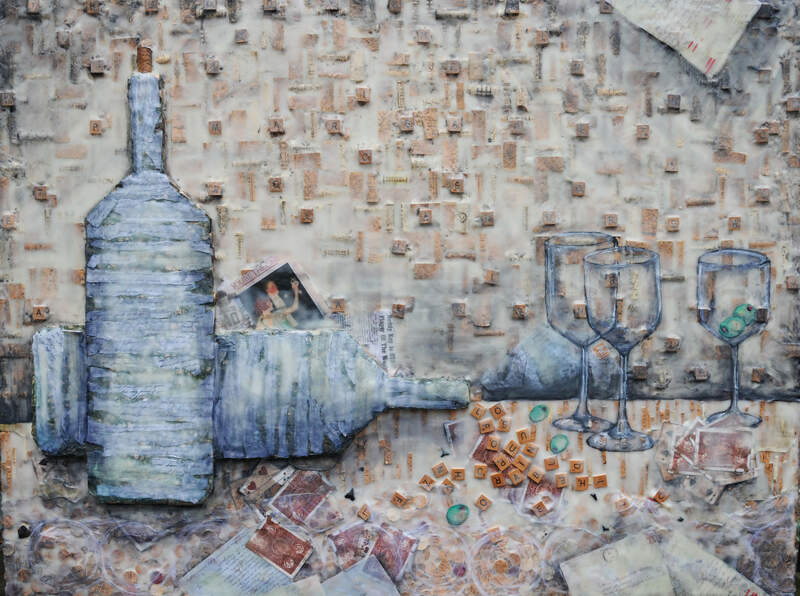 Since I was working so heavily with corks, I opted for a wine theme, to bridge the material with the imagery. While I was planning out a rough design, Aunt Margaret began discussing the project with family members. As they talked about the future creation, stories of Uncle Buddy began to be swapped, sand volcanoes on the beach, the endless search for sharks teeth, his love for all things boards games and card tricks. As the family reminisced Aunt Margaret decided she wanted a type of “Buddy search,” a bigger image filled with all things Buddy hidden in the layers and objects. Soon after, I received another package filled with sharks teeth, newspaper clippings of Uncle Buddy’s high school football career, and beautiful letters written between Aunt Margaret and Uncle Buddy, while he was in the military. As we threw ideas back and forth, it began to take form in my mind, and become a reality on the wood panel. 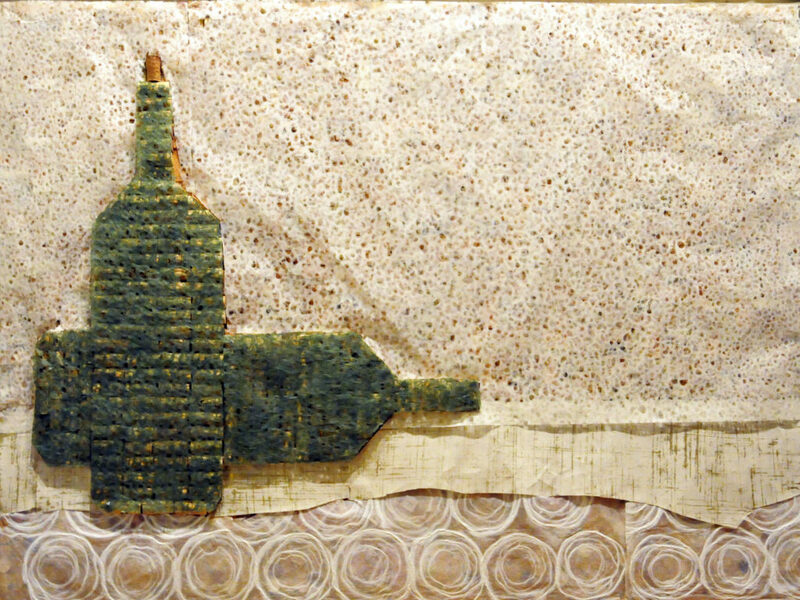 I started by cutting corks in half, and gluing them to the panel to create a pattern in the background. I used whole corks to form the wine bottles, to create a sense of depth between the bottles and background. I cut wine corks in strips to go under the wine bottles, and define a tabletop space. At the very bottom I cut wine corks into circular sections to create a wave like pattern, reminiscent of the beach, and Hilton Head Island where they have spent much of their time. To reference Uncle Buddy’s interest in cards and scrabble, I incorporate both into the piece. I decided to make it appear as though scrabble tiles where pouring out of the sideways wine bottle, spilling over a card game. I also used the tiles in the background, and spelled out each name in their family: Buddy, Margaret, Andrew, and Aaron. I’m still not sure this is a part they have discovered yet, but I enjoyed every minute of creating this personal scavenger hunt. Once the base layer was complete, I added thin, art paper over top. 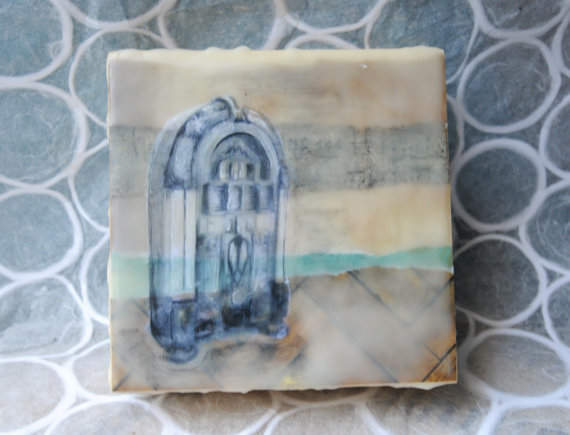 I knew from the beginning I would cover the entire piece with encaustic wax. 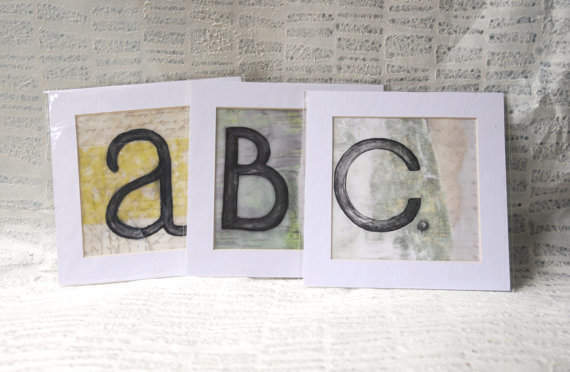 When the encaustic is melted onto certain types of paper, it create a semi-transparent look. 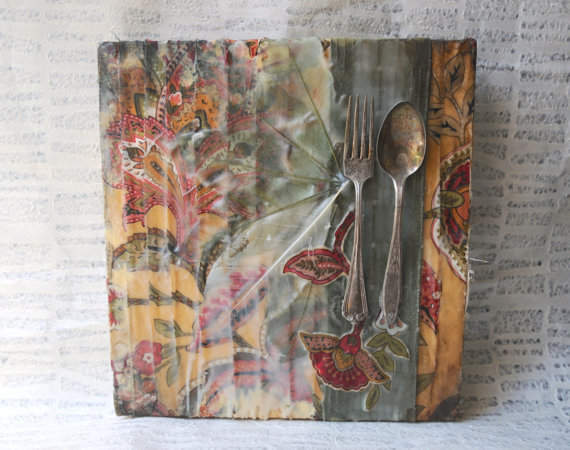 I often play with encaustic and collage, and I was excited to have the additional elements of the corks, tiles, and cards added. 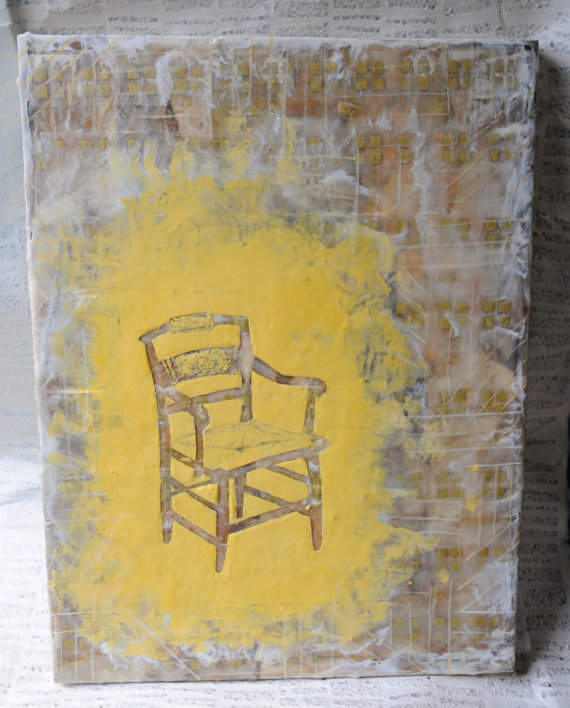 I used different types of paper to distinguish the different areas, tacked it down with hot glue, then began painting the many layers of melted encaustic wax. 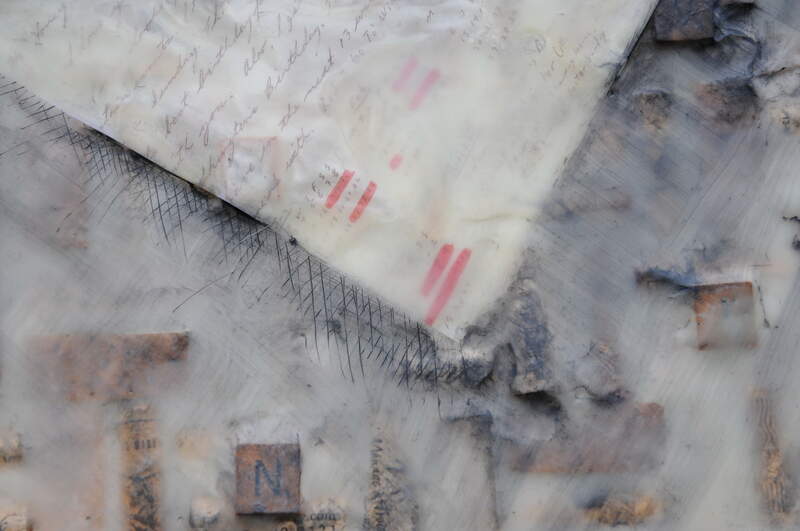 As I layered the wax, I also began incorporating copies of the letters and newspaper clippings. Although Aunt Margaret encouraged me to use the originals, I couldn’t bear to essentially ruin these family memories. I made high quality color copies, to maintain the ink color, and match them as close to the originals as possible. I scattered the envelopes and letters along the top, bottom, and behind the wine bottles. 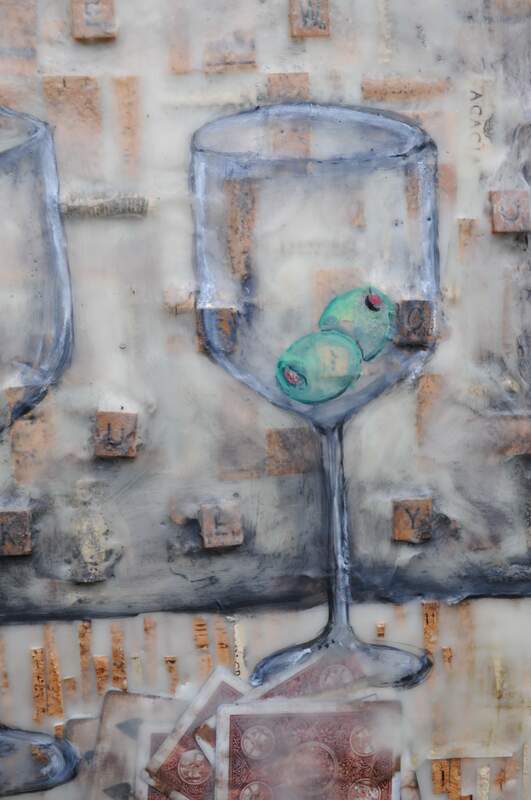 I also decided to layer the wine bottles with ripped up sections of the letters to tone down the dark green and create an interesting pattern with the mix of handwriting. Once I finally achieved a fairly smooth, wax surface, and was satisfied with the placement of the letters, I began painting. I added wine glasses, olives, and shadows to help define the sections further. A number of times I added something, only to remove it the next day. The piece transitioned from light, to a dark background, from one to two to three wine glasses, it was continuously changing and I couldn’t seem to find my stopping point. After seeking out second opinions from my wonderful husband and mom, I decided to add dark shadows to certain areas to create more contrast. I finally began to strike a balance in the piece, I was finally seeing the end. I emphasized the separation between the table and the background with a harder, dark line. The shadows under the wine bottles were emphasized, as well as around the letters. I also began scratching into the surface of the wax to create crosshatched shadows. I darkened the shadows around the wine glasses to help the white highlights pop. As I painted in the glasses and olives, I opted for a semi-transparent look. I left the olives with see through centers, and a more sketchy feel. I love the play between the background and foreground. The wine bottles finally began to pop, the letters stood out against the background, and your eye was drawn around the piece. It finally felt complete. I was very pleased with the end result and excited it was going to a family I already love so much, to be hung in their living room. I know they will look at it and appreciate it every day. 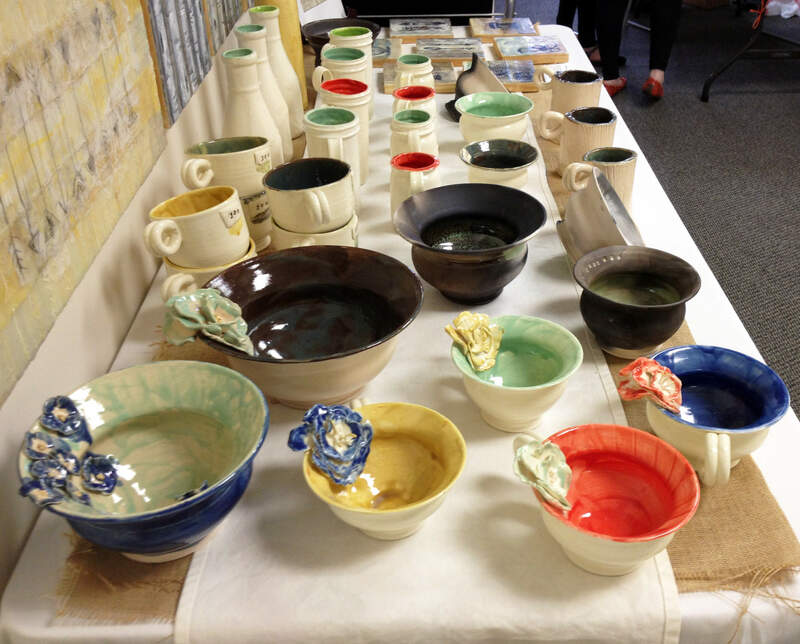 After a very successful show with Whimsical Wares this past November, I decided to team up with them again and participate in their spring show. 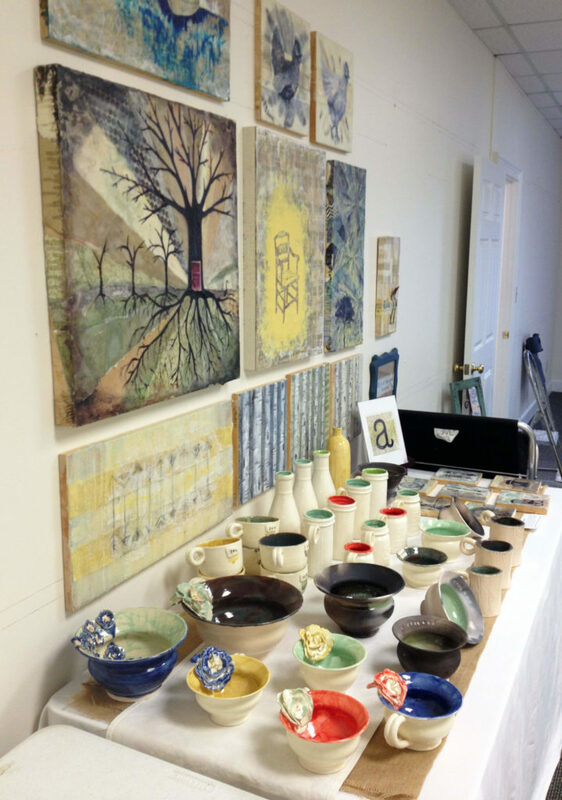 Debbie And Helaine have worked endless hours to find artists who offer interesting arts, crafts, jewelry, and other unique gifts. This show is just in time for Mother’s Day shopping and the upcoming wedding season. 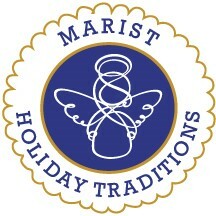 It opens today, located in Marietta at 255 Village Parkway, Building 500, Suite 580. 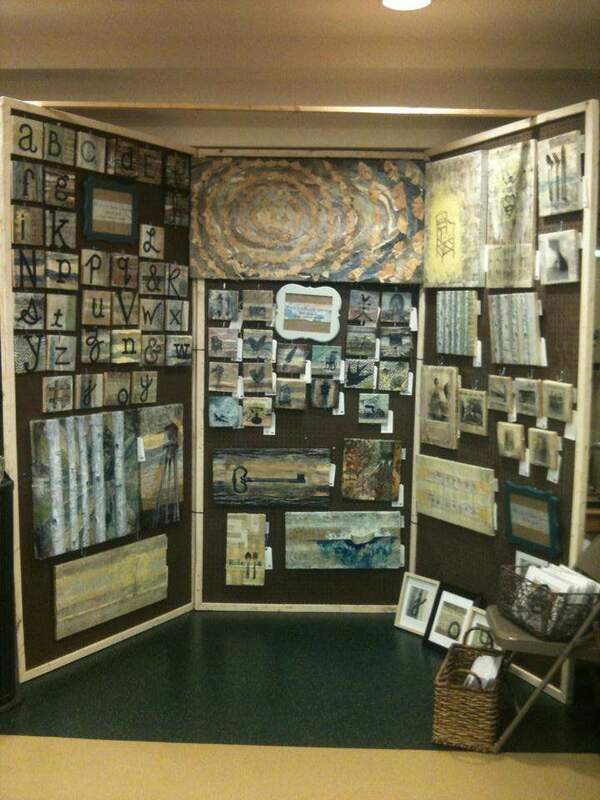 For this show I decided to include a mix of my encaustic mixed media, letter prints, and pottery. I love working with a variety of media, and I am excited to present the wide range I work in. This year, I started experimenting with slip casting after teaching a slip cast lesson to my high school, 3D Design II students. 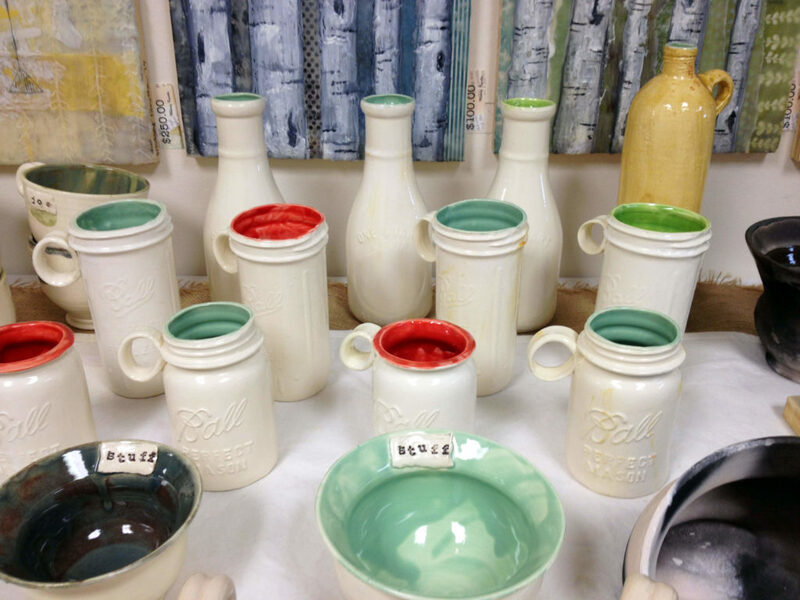 I fell in love with the process, and began making my own slip cast molds of antique milk jugs and mason jars. You can shop my new slip cast creations at the Whimsical Wares show, at Crafted Westside, located off Marietta Street in Atlanta, or at the Crafted pop up shop in Avalon, Alpharetta. In addition to my slip cast pieces, I also have my usual flower decorated bowls and mugs. I also have a few saggar fired bowls, which creates interesting smoke like patterns on the pieces. 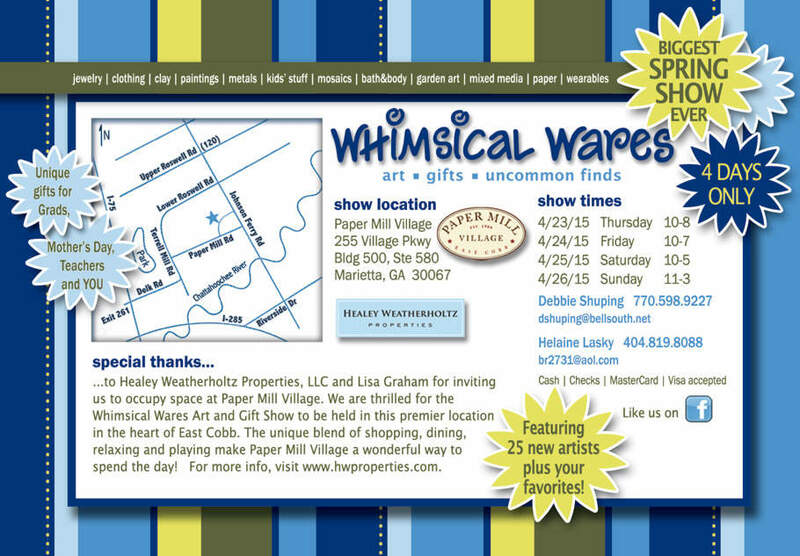 I hope you find time to check out the Whimsical Wares spring show. 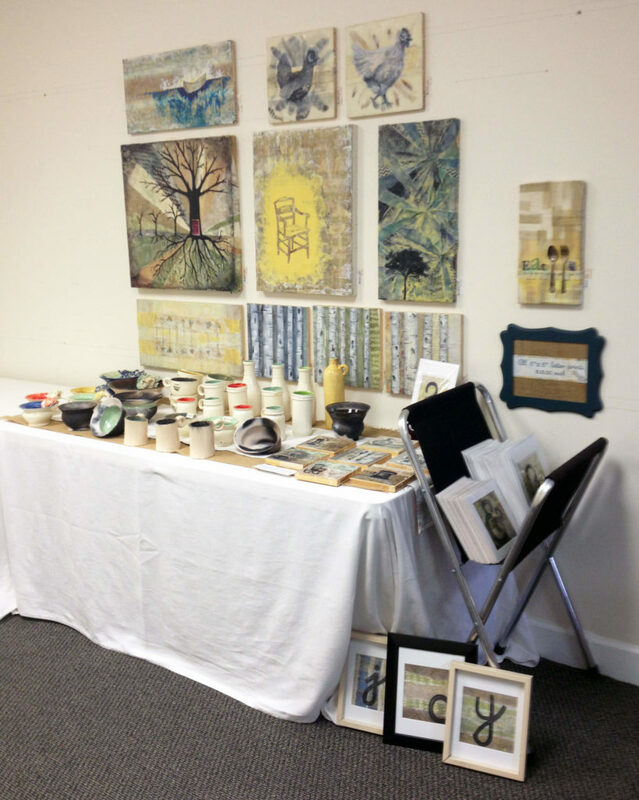 If you miss it this weekend, you can also check out my artwork at the 17th annual Wesleyan Artist Market, opening next weekend, 4/30/15 through 5/2/15. 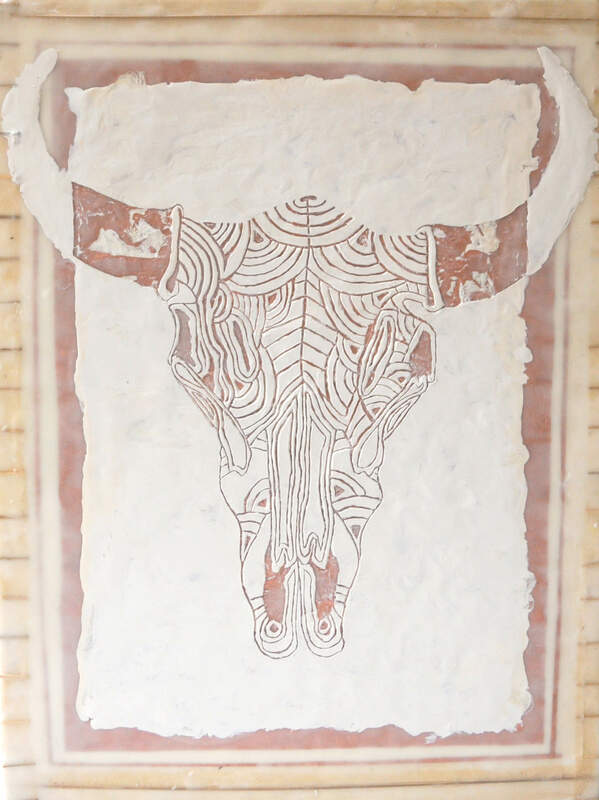 Thanks for taking the time to check out my blog and read about my latest art and craft endeavors. Help me spread the word about my blog and artwork by subscribing or sharing on your social networking site of choice. Thanks for stopping by!